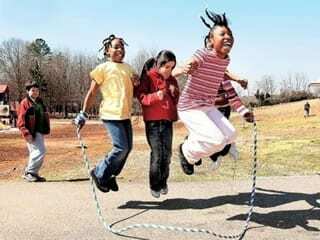 School grant provides new games and activities for students at recess. Student enjoy benefits of school grant for new playground. Imagine a playground without pushing, shoving or kids standing on the sideline of the activities feeling left out. That’s what California Area Middle School principal Ray Huffman did after reviewing student surveys. “I look at data all the time, and I did a student survey. One area where we had kids getting hurt from not playing well with others was on the playground. We looked at what we could do to make a more inviting environment so all kids would participate,” Huffman said. Huffman said he found the Peaceful Playgrounds program through an Internet search, and then matched it up with the Highmark Foundation’s Healthy High 5 School grant program. A $6,314 school grant covered 100 percent of what was needed to implement the Peaceful Playgrounds program at the middle school. The program involves marking out specific play areas on the playground for a variety of games, spreading the children out evenly in the play area. Huffman said middle school students in the thematic art class will paint the markings on the playground and all students in the school will be taught the rules of the games and conflict resolution strategies. Playground monitors will also be trained to handle situations quickly and fairly, asking children to leave the play area and work out the disagreement before returning to play. “All the teachers will be taught in an in-service how to teach the kids to play these games together appropriately,” Huffman said. Huffman said all teachers in the building have lunch and playground duty on a rotating basis. Huffman said he would like to see at least part of the Peaceful Playgrounds program initiated this spring, with the full program in place for the start of school in the fall. “We will collect data on incidents and do a survey on how the kids enjoy it, and maybe in the future the district will provide some funding to sustain it,” Huffman said. According to the Peaceful Playgrounds Web site, districts that have implemented the program have seen a decrease in serious playground injuries by as much as 80 percent and an increase in student participation in playground activities.